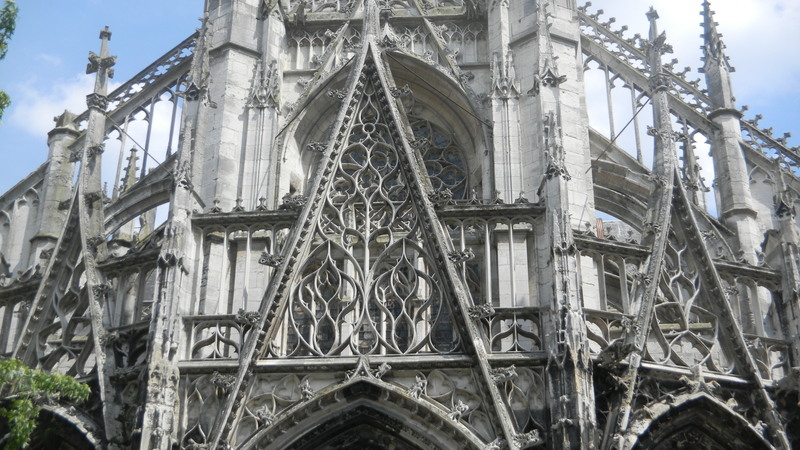 Gothic architecture evolved into many different styles over time. It also took on many regional variations. We saw examples of classic style in Top Gothic Cathedrals, Churches and Chapels Part One. Now we’ll explore ways Gothic style changed. 1. 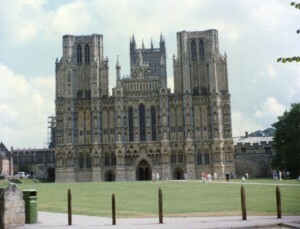 Wells, England. While the French loved towers that rise to the heavens, the English related to horizontal frontages. The west facade extends in both directions, with lots of sculpture. 2. Cologne, Germany. Its west facade is a stunner. It’s overwhelmingly large, but it was built in the 19th century. The cathedral’s real treasures are at the other end. The choir is the only part of the cathedral from the Middle Ages. It’s largely in French classic style, but it has one of the highest naves, and perhaps the finest system of flying buttresses anywhere. Sit outside for a while and savor them. The Cathedral also houses the Gero Crucifix, which has an unusually realistic sculpture of Jesus from the 10th century. Cologne was already on its way to becoming one of northern Europe’s leading commercial centers, and its residents wanted a life-like figure they could relate to in concrete terms. They were 200 years ahead of their time. 3. Strasbourg, Germany. 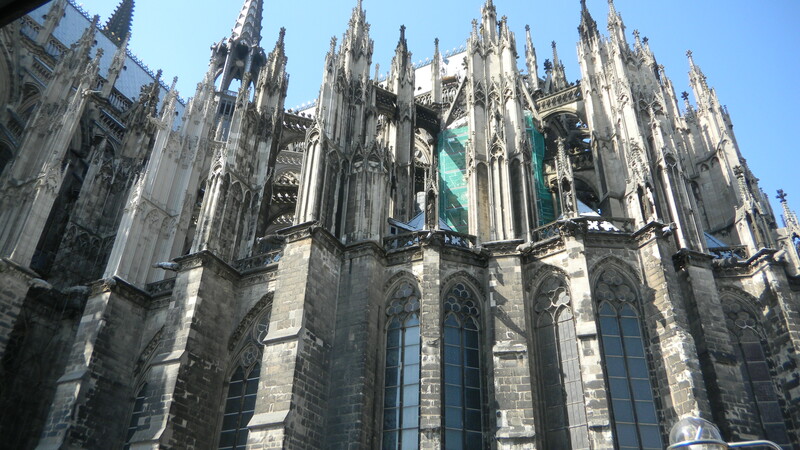 This is a better example of German style than Cologne Cathedral is. Its laced west facade gives it a more fanciful look than French style’s classical balance. 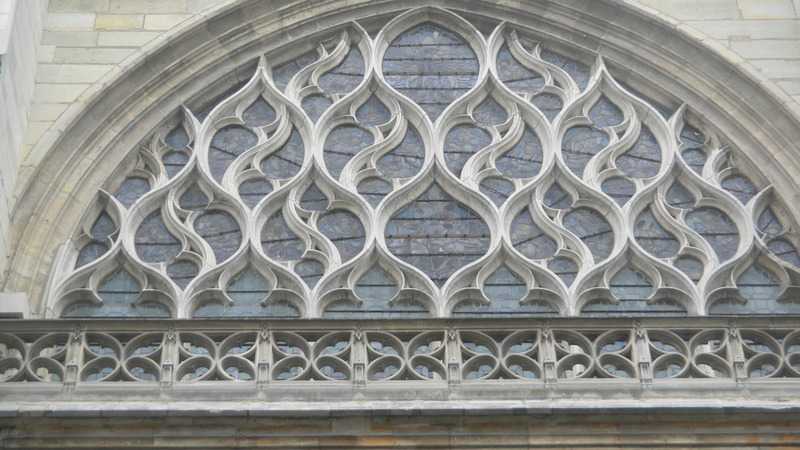 It also has some of the oldest stained glass windows anywhere. 4. Santi Giovanni e Paolo, Venice, Italy. Italian Gothic was often in warm earthy hues. People were happier to enjoy the here-and-now than aspire for what you can’t see. The ample light from the large choir windows heightens the effect. Guisseppe Verdi said, “You can have Heaven, just give me Italy.” This building’s interior might make you agree with him. 5. Sienna, Italy. This is closer to Rome than Venice is, and it incorporates its ancient imperial grandeur in the West Facade’s arches. The pulpit was carved by one of the Pisano brothers, who brought classical realism back and inspired Renaissance sculpture. The library’s frescos were painted by Pinturiccio, and the baptistery was sculpted by Ghiberti. An artistic feast. 6. Saint Chappelle, Paris. The stained glass takes up so much space that you feel bathed in light. The iconography was actually Louis IX’s self-promotion as the keeper of the holy relics, but is any of today’s political rhetoric as beautiful? 7. Saint Severin, Paris. 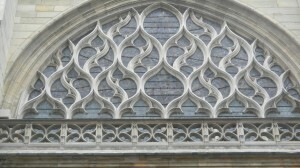 Gothic style evolved from classic to Rayonnant and Flamboyant. The logical divisions of classic style dissolve into waves and swirls that look like flames aspiring for Heaven. Mystical currents emerged in the late Middle Ages to cope with the traumas of the Black Death and the One Hundred Years War. 8. 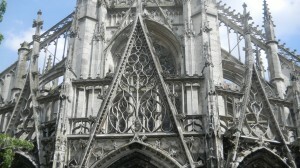 Saint Maclou, Rouen, France. A beautiful example of Flamboyant style. 9. Kings College Chapel, Cambridge England. A perfect culmination of the English love of lines (which we saw in Part One). You can join Eveningsong.